Figure 1. 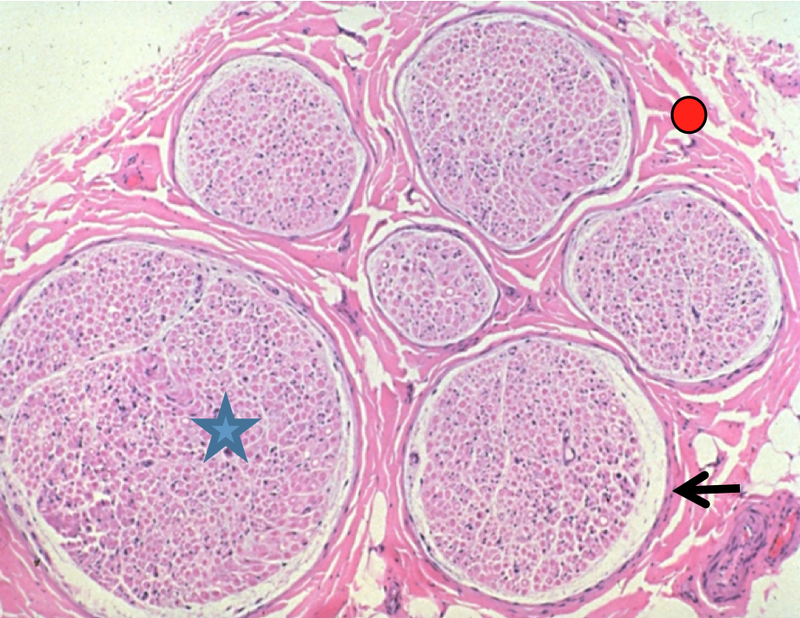 Endoneurium (star), perineurium (arrow), intrafasicular epineurium (circle)Nerve fibers along with their Schwann cells are surrounded by a loose connective tissue called endoneurium and are grouped together into bundlers called fascicles. Each fasicle is surrounded by a layer of collangeous connective tissue called perineurium. 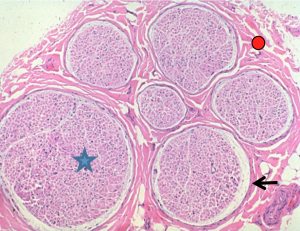 Groups of fascicles are enveloped by yet another connective tissue layer called epineurium. Each peripheral nerve is composed of one or more fascicles of nerve fibers. Peripheral nerve imaging is capable of demonstrating normal versus abnormal nerves, and provides anatomic detail utilizing a combination of fat suppressed T2-weighted, T1- weighted and proton density images. Contrast is utilized in cases of suspected neoplastic involvement and inflammation. PNI assists in the evaluation and treatment planning of trauma, entrapment neuropathy, nerve sheath tumors, metastases and inflammatory demyelinating polyradiculoneuropathy. For example, identification of a completely normal course and caliber for a nerve under suspicion, argues against surgical treatment. In the setting of trauma, PNI is beneficial in the assessment of nerve continuity and neuroma formation. (Figure 2) In addition, identification of anatomic variants, such as those involving the sciatic nerve, plays a role in improving the safety of surgical procedures for the release of pelvic sciatic nerve entrapment. Figure 2. Gunshot wound to leg. The normal right sciatic nerve is seen (white arrow). On the left the path of the bullet is annotated by the red arrows. 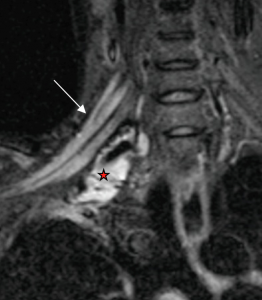 The involved left sciatic nerve is easily seen (gold arrow). It is enlarged, and the normal fascicular pattern is disrupted. In addition to the visualized neuroma, nerve imaging allows for the length of involvement to be determined. PNI can also help differentiate radiation induced neuritis and recurrent disease after treatment. Radiation neuritis results in a uniform symmetric thickening and enhancement of fibers and trunks and T2 hyperintensity (Figure 3), whereas recurrent disease typically will demonstrate an asymmetric enhancing mass. Figure 3. Patient with history of Pancoast tumor status post resection and radiation therapy 10 years prior who returns with pain in the right upper extremity. Coronal STIR image reveals uniform T2 hyperintensity and thickening of the brachial plexus (arrow). These findings remained stable and are consistent with radiation plexitis. Abnormal T2 signal inferior to the brachial plexus reflects post surgical change (star). PNI with MRI also allows for assessment of the involved musculature. An increase in T2 signal can be seen in denervated muscles as early as 4 days post injury. Muscular volume loss and fatty infiltration indicate prolonged denervation, which is one of the important factors in negatively influencing functional outcome. Limitations of PNI include the assessment of small nerves, and it has limited utility if imaging is performed 2 years after onset of symptoms. To order peripheral nerve imaging, order imaging of the body part in which the suspected injured nerve is involved. For example, if the distal sciatic nerve is suspected, order a lower extremity MR and specify nerve imaging in the request. For questions, contact Alice Smith, MD at asmith@hawaiidrs.com. Soldatos T et al. High-resolution 3-T neurography of the lumbrosacral plexus. Radiographics 2013;33(4):967-87. Chhabra A et al. MR neurography: Advances. Radiol Res Pract 2013;2013:809568.doi:10. 1155/2013/809568. Epub 2013 Mar 26.